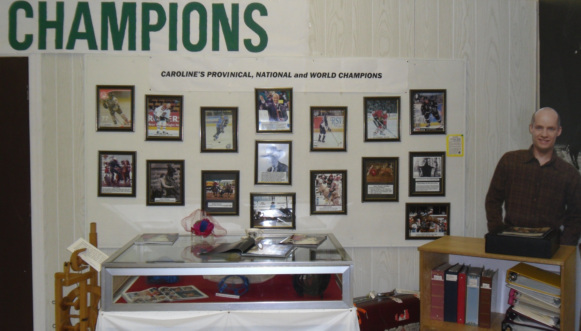 Welcome to the Caroline Wheels of Time Museum and Historical Village which features the history of pioneers in the Caroline area. 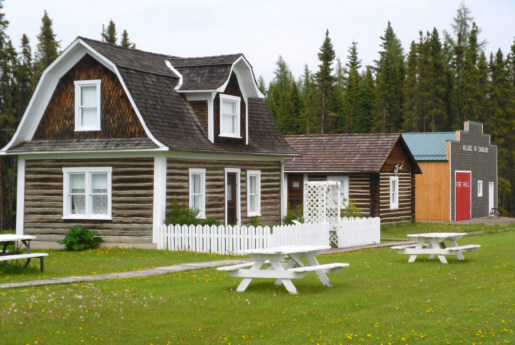 We have six buildings including the Trunnell House, a two storey log home built in the early 1900’s and furnished with era related antiques. Next door, inside the Anderson Brothers “trapper's cabin” you will find a number of mounted animals indigenous to the area along with our “tools” display. The last building in this row is our combination Village Office, Lock-up and Fire Hall complete with a jail and fire engines. In the back row we have our Big Bend School a one room country school and a teacherage. In our Main Building we have our exhibits, we have the 100 year Family Pioneer Genealogy collection. In the east wing we have our feature exhibit which changes each year. This year features Coming Home from the War and Community Support to Kurt's career. We opened our Nature Trail and we have a grassy area and picnic tables. We welcome picture taking, so bring your camera and spend some time with us.